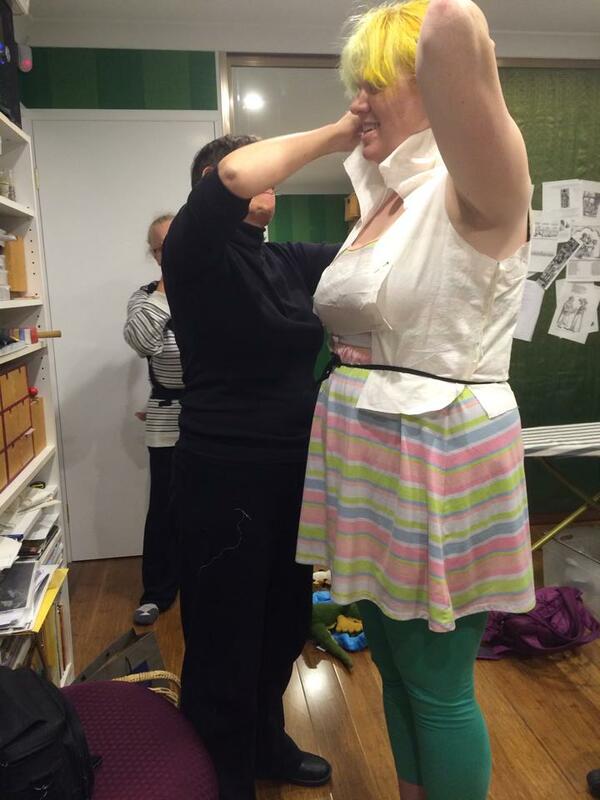 Update 4: Socks and Cauls and Hats, Oh My! Couching finished (10 hours of couching is visible in the photo below – I’ll estimate the rest of the couching once I’ve unwound it from the frame… after the beading, that is). 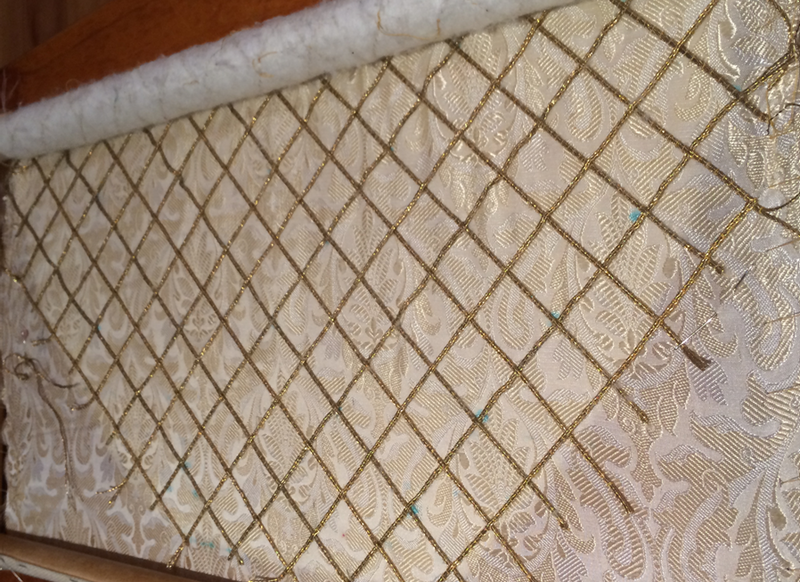 This is 10 hours of hand couching, with at least 5 hours more rolled up on the frame. 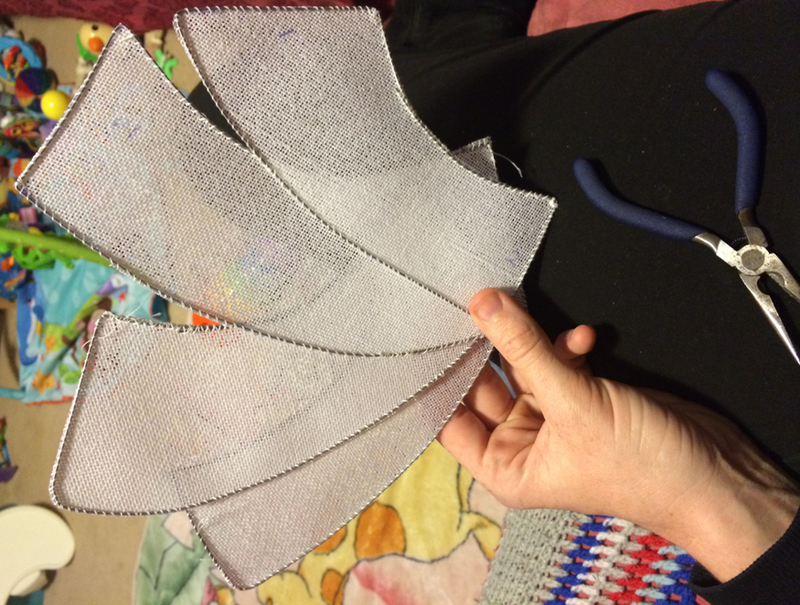 I couched milliners wire to the buckram brim pieces. Each piece took about 1.5 hours. 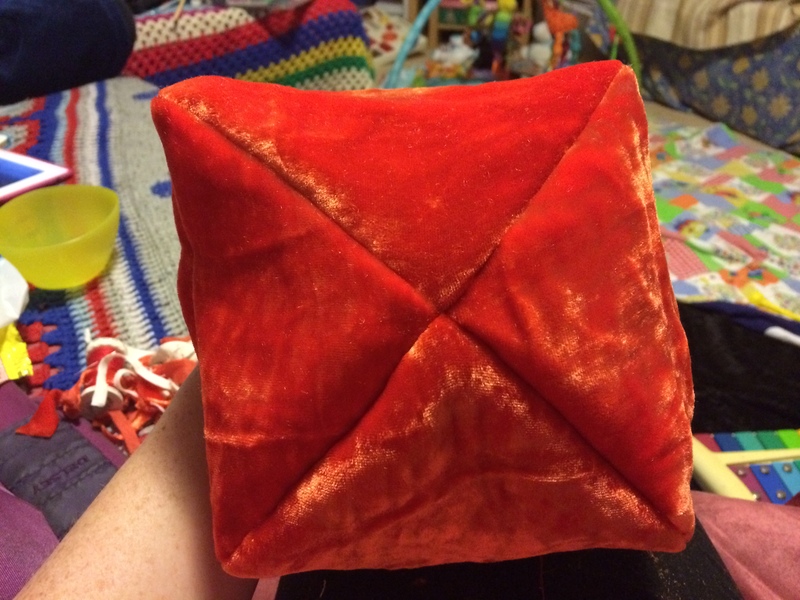 I used the template to cut out the crown pieces from orange silk velvet and a linen canvas inter-lining. I then hand stitched the pieces together. The silk velvet is quite stretchy and extremely difficult to use, so far. 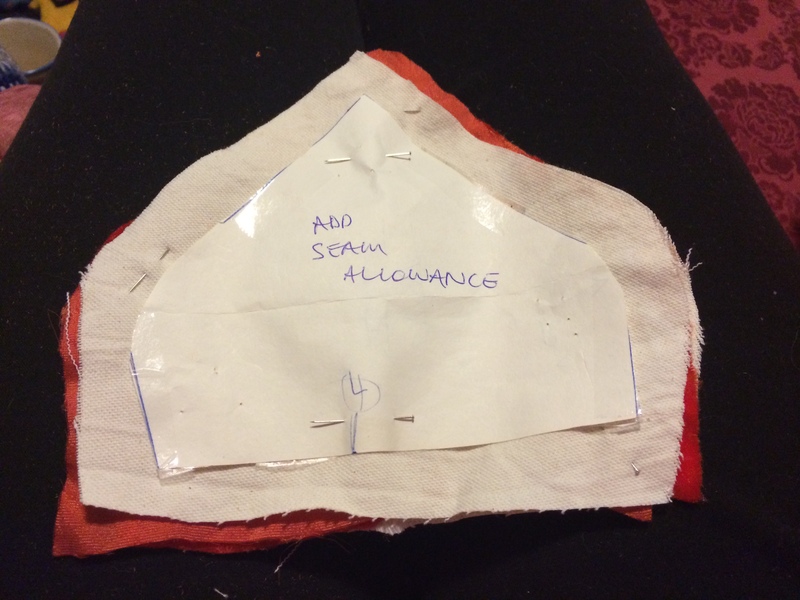 Cutting out the interlining and outer fabric for the crown. The pattern is sitting on top. Four of these pieces make the crown. The crown is put together, but needs the seams carefully ironed flat. Next steps: carefully iron the seams so they sit nicer, cut out lining (silk) and line the crown. Planned how to do the slashing. Will need four layers; outer orange silk brocade, thick lining and edging lining (probably a black or gold colour? ), background layer (green velvet) and lining. 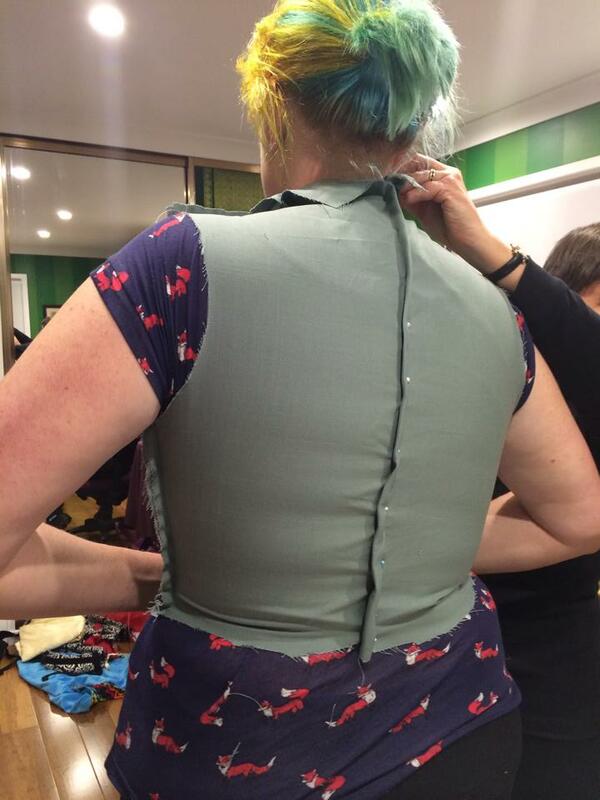 Mathilde and Rowan fitted a pattern on me (two drafts). Pattern based on Rowan’s dresses and then Rowan and Mathilde adjusted on me to look like the portraits. Draft one of the bodice pattern. Draft 2 of the bodice pattern. 4 strings of 3mm pearls (approximately 640 pearls in total) from rings-things. 1 gram of 3mm, gold-gilt spangles from Hedgehog Handworks. 16 medium black ostrich feathers (30-50cm) from Photios Brothers.